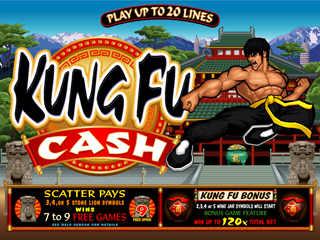 Swords, Yin-yang symbols and mysterious women are only a glimpse of what you’ll find in the world of Kung Fu Cash. With intensive training in the world of martial arts these warriors come equipped with hands of steel, but they’re not afraid to use their weapons. Chop your way to the bonus round where the action begins. Get your nunchaku out and prepare for your daily training. Smash 3 out of 12 jars and watch your credits add up. 2, 3, 4 or 5 Jar Symbols in any stop position on adjacent reels will start the Kung Fu Bonus where you can win up to 120x your Total Bet. 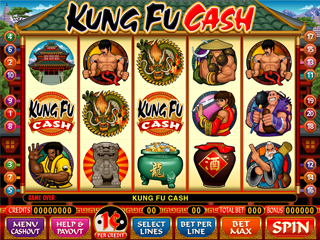 3, 4 or 5 Stone Lion Symbols pay up to 100x the Total Bet plus 7 to 9 Free Spin Games.